My partner Helen and I found out that we were having our first child on 31 January (it’s a date that Helen remembered, all I recall is her desperate attempts to gain my attention whilst I was on the phone to a client!). This has brought a whole new meaning to commitment; it means I am now even more committed to my relationship with Helen and it has sharpened my focus and commitment as a photographer. Our son, Rupert was born on 20 September and I wanted to capture a number of photographs of his early days. Given Rupert’s birthday in late September, I wanted to reflect the autumn season. With this in mind, I decided to photograph Rupert set against the varied and beautiful colours of autumn which are well represented by the leaves which appear to fall, almost as if overnight, during late September. So, during walks with Pork Pie and Pickle (our dogs – also known as Holly and Barney), I collected a number of leaves and then purchased a small section of artificial grass upon which to place Rupert (Helen objected to using a piece of turf from a DIY store!). Rupert’s Nanna kindly (and very quickly!) knitted a blanket which further highlighted the autumnal colours and also protected Rupert’s modesty! Its easy to say that newborn photography is somewhat challenging! 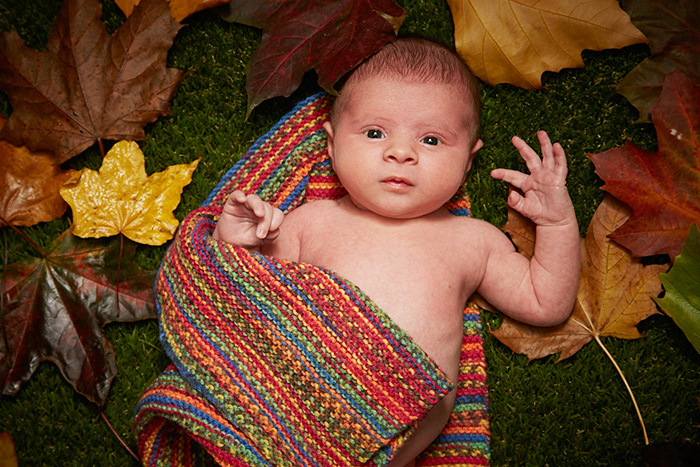 Rather than using my studio, the shoot took place in our lounge (which was much warmer) and involved a couple of nappy changes, some crying and various rushed leaf re-arranging! Nevertheless, the results were well worth the effort and both Helen and I are delighted with the final pictures. Looking back at the photograph now (it was taken four weeks ago), it has dawned upon me how important it was to capture such a special time in Rupert’s life. Rupert has changed; there is a fragility just 4 weeks ago that is already gone. To some degree, the same can be said of any photograph which is a small but precious snapshot in time. The meaning of family is now very much at the forefront of my mind and I appreciate, more so than ever before, the importance of photography when recording special family events. I have an obligation to catalogue Rupert’s life in photographic form and also produce some fabulous family photographs for my wedding clients over the years to come. The effect of this news at the start of the year sharpens my focus and commitment to wedding photography two fold; firstly, I need now more than ever before to know that my finances are stable and the second reason is that the value of relationships and family mean more than it did before. Our Son “Rupert” obviously means the world to us and with this comes an almost essential responsibility to capture the beginnings of his life for the many years we expect to look back on. My father is a retired professional photographer, as such I have a childhood that is documented perhaps a little better that some in my generation. This being the case the pressure is on to make sure Rupert’s Childhood is as well covered by the lens as mine… I’m pleased to say that once my father had seen the results his approval was obvious from the outset and a badly duplicated copy from Facebook already resides on my parents fridge! It goes without saying that a high quality framed print is the next thing on the agenda and there are of course plenty more photographs to take.